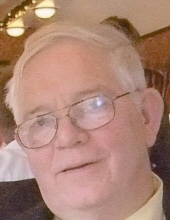 Celebrating the life of Robert A. Ritcey, Sr.
Obituary for Robert A. Ritcey, Sr.
Robert A. Ritcey, Sr., age 72, passed away Tuesday, November 13, 2018 at the Good Samaritan Medical Center in Brockton. He was the son of the late Austen and Genevieve (Casey) Ritcey. Robert was born on June 18, 1946 in Needham and was a graduate of the Newman School in Boston. He proudly served his country in the US Army Reserves. He was employed as lumber salesman for D.B.& S. Lumber in Norwell. A Foxborough resident, he was raised in Westwood and was formerly of Brockton. Robert was married to his wife Marion (Ahern) for 48 years. Robert was a model train enthusiast , a member of the New England Train Collectors Association and a great story teller. He was a loving and devoted husband, father and grandfather. Loving husband of Marion (Ahern) Ritcey. Devoted father of William A. Ritcey and his wife Lori of Pawtucket, RI and Robert A. Ritcey and his wife Marisa of New Orleans, LA. Beloved grandfather of Tracy, Kayla and Crystal. Great grandfather of Kayden and Autumn. Also survived by a niece, nephew and many cousins. Relatives and friends are kindly invited to attend calling hours on Tuesday, November 20 from 4 to 8 PM at the Roberts and Sons Funeral Home, 30 South Street, Foxborough. A Funeral Mass will be celebrated on Wednesday at 10 AM at St. Mary’s Church, 58 Carpenter Street, Foxborough. Interment to follow at Blue Hill Cemetery in Braintree. For additional information please contact 508 543-5471. To send an on line condolence please visit the funeral home web site at www.robertsandsonsfuneralhome.com. If you wish, donations in Robert’s memory may be made to the Foxboro Discretionary Fund, P.O. Box 636, Foxborough, MA 02035. "Email Address" would like to share the life celebration of Robert A. Ritcey, Sr.. Click on the "link" to go to share a favorite memory or leave a condolence message for the family.